More than 29,000 teachers and education professionals will not report to work today 9/10. CHICAGO – After hours of intense negotiations, the Chicago Teachers Union (CTU) and the Chicago Public Schools (CPS) have failed to reach an agreement that will prevent the first teachers strike in 25 years. Pickets are expected to begin Monday at 675 schools and the Board of Education as early as 6:30 a.m. Teachers, paraprofessionals and school clinicians have been without a labor agreement since June of this year. Chicago teachers on strike. Photo from their Facebook page. “Talks have been productive in many areas. We have successfully won concessions for nursing mothers and have put more than 500 of our members back to work. We have restored some of the art, music, world language, technology and physical education classes to many of our students. The Board also agreed that we will now have textbooks on the first day of school rather than have our students and teachers wait up to six weeks before receiving instructional materials. 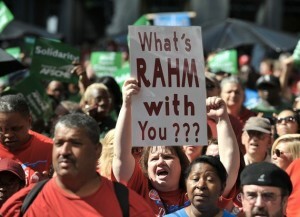 Chicago teachers at Labor Day, 2012 march. “Recognizing the Board’s fiscal woes, we are not far apart on compensation. However, we are apart on benefits. We want to maintain the existing health benefits. “Another concern is evaluation procedures. After the initial phase-in of the new evaluation system it could result in 6,000 teachers (or nearly 30 percent of our members) being discharged within one or two years. This is unacceptable. We are also concerned that too much of the new evaluations will be based on students’ standardized test scores. This is no way to measure the effectiveness of an educator. Further there are too many factors beyond our control which impact how well some students perform on standardized tests such as poverty, exposure to violence, homelessness, hunger and other social issues beyond our control. “We want job security. Despite a new curriculum and new, stringent evaluation system, CPS proposes no increase (or even decreases) in teacher training. This is notable because our Union through our Quest Center is at the forefront teacher professional development in Illinois. We have been lauded by the District and our colleagues across the country for our extensive teacher training programs that helped emerging teachers strengthen their craft and increased the number of nationally board certified educators. “We are demanding a reasonable timetable for the installation of air-conditioning in student classrooms–a sweltering, 98-degree classroom is not a productive learning environment for children. This type of environment is unacceptable for our members and all school personnel. A lack of climate control is unacceptable to our parents. 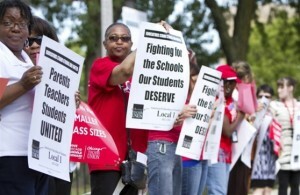 Chicago teachers and parents on earlier informational picket line. “As we continue to bargain in good faith, we stand in solidarity with parents, clergy and community-based organizations who are advocating for smaller class sizes, a better school day and an elected school board. Class size matters. It matters to parents. In the third largest school district in Illinois there are only 350 social workers-putting their caseloads at nearly 1,000 students each. We join them in their call for more social workers, counselors, audio/visual and hearing technicians and school nurses. Our children are exposed to unprecedented levels of neighborhood violence and other social issues, so the fight for wraparound services is critically important to all of us. Our members will continue to support this ground swell of parent activism and grassroots engagement on these issues. And we hope the Board will not shut these voices out. Rally in support of CTU strike. “While new Illinois law prohibits us from striking over the recall of laid-off teachers and compensation for a longer school year, we do not intend to sign an agreement until these matters are addressed. “Again, we are committed to staying at the table until a contract is place. 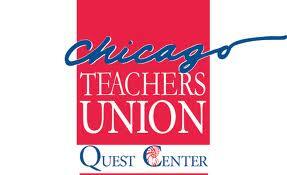 However, in the morning no CTU member will be inside our schools. We will walk the picket lines. We will talk to parents. We will talk to clergy. We will talk to the community. We will talk to anyone who will listen-we demand a fair contract today, we demand a fair contract now. And, until there is one in place that our members accept, we will on the line. 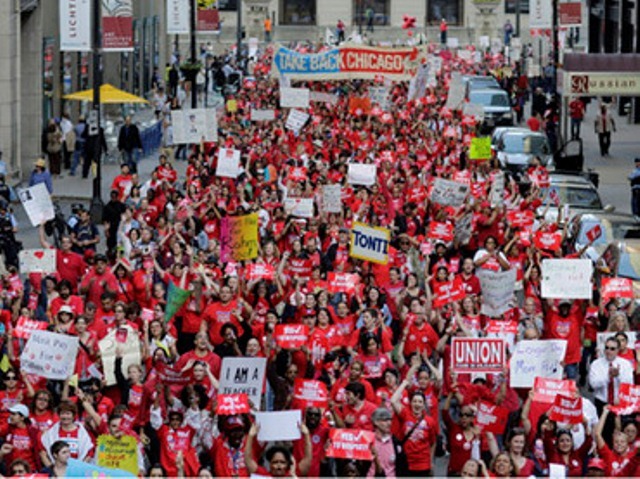 The Chicago Teachers Union represents 30,000 teachers and educational support personnel working in the Chicago Public Schools, and by extension, the more than 400,000 students and families they serve. 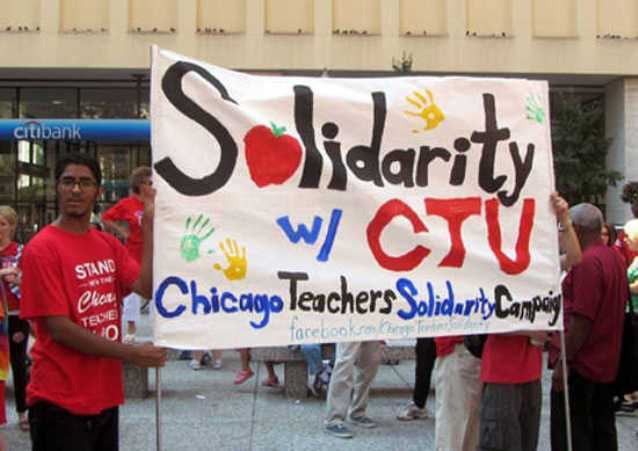 The CTU is an affiliate of the American Federation of Teachers and the Illinois Federation of Teachers and is the third largest teachers local in the United States and the largest local union in Illinois. For more information please visit CTU’s website at http://www.ctunet.com. Chicago Teachers Solidarity Committee is organizing support. The struggle of the public school teachers in Chicago, the back yard of President Barack Obama and Education Secretary Arne Duncan, has nationwide implications; in fact, it has already begun to shape up as one of the most important labor struggles in many years, with a powerful corporate anti-teacher lobby pulling out all stops in their effort to defeat the Chicago teachers. It is now time for every AFT local in the country to organizing solidarity resolutions and financial support for the embattled Chicago unions. Statements from international teachers’ unions are also urgently needed and should be sent directly to the CTU. For their contact information, please visit CTU’s website at www.ctunet.com. For other unions, central labor councils and community organizations, steps to back the CTU can start with resolutions of support, pledges of financial assistance, and commitments to walk picket lines. In Chicago, CTU members are available to speak at union meetings in Chicago, and could call or Skype into meetings elsewhere. The Chicago teachers need — and deserve — everyone’s support! The teachers have signed a “No Strike” agreement prior to this contract. 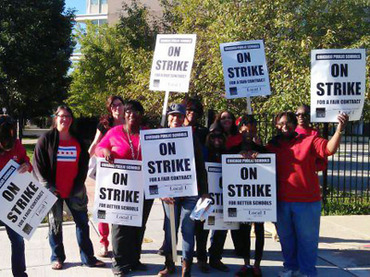 They accuse the Chicago Public School district of breaking their contract and they break the contract and strike. They should all be fined a days pay for each day they’re on strike. The CPS should hire replacement teachers (I’m sure that there are many unemployed teachers out of work) and fire the strikers.